Talamanca, Ibiza. 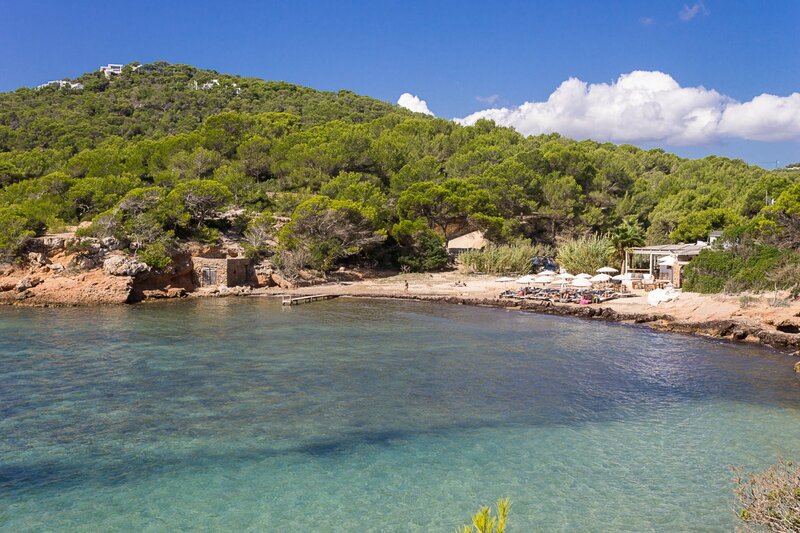 Small bay hidden away with a real feeling of seclusion featuring a sandy beach and a lovely restaurant. Getting there: Only reached by car or bicycle. Coming from Ibiza Town drive to Jesús and turn right behind the church. Follow the main street through the whole village and turn left where you see a rock with the beach's name painted on it. Follow the road until you see a rock on the right with Cala Bonita on it and turn right here. Follow the steep dirt track down to the beach. Good parking possibilities, free of charge. S'Estanyol beach is a pretty little cove that's off the beaten track making it perfect for when you want to escape from the crowds, especially during high season. Directly next to a car park is a small strip of sand where families go, whilst on the left hand side is a strip of higher rocks and fishermen's huts, where nudists go for peace and quiet. The entrance to the sea is rocky, though if you enter the sea from the small wooden pier from the sanded area, the seabed becomes smoother and the waters are crystalline and pure. If you want to enter the water via the fishermen's huts on the left, you can, though bathing shoes are recommended. All around you will find sea areas that are ideal for snorkelling. The beautiful Cala Bonita beach restaurant is made out in lovely natural eco-chic decor with wooden tables redolent of the rustic fishermen's huts next to it. Food is of the highest quality, blending the simplicity of using fresh local ingredients with touches of haute cuisine finesse. By day it's the ideal spot to enjoy long lazy lunches or by night, romantic candlelit dinners. The restaurant also rents out parasols and sun loungers with very comfy mattresses - perfect for beach days with a bit of comfort and luxury. Talamanca, here you find a good choice of hotels for each budget. Ibiza Town also is just a 15-minute drive. Or, why not live the dream of an Ibiza holiday and rent a private holiday villa nearby?